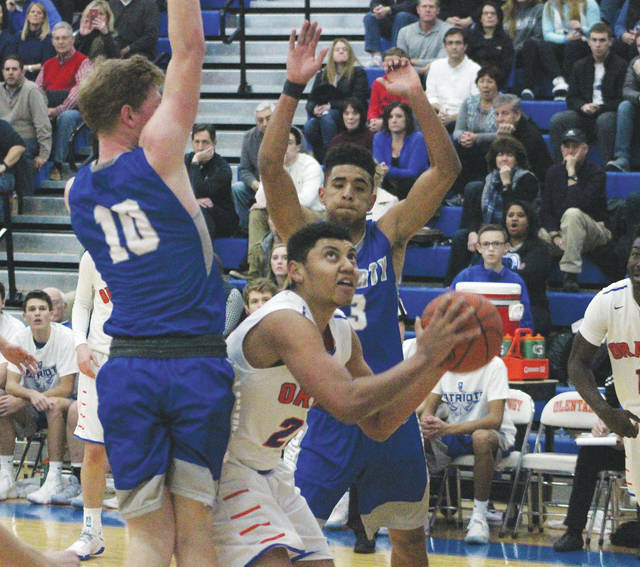 Olentangy’s Orange’s Jalen Bethel, center, works against Liberty’s Ben Roderick, back, and Grant Wilson in the post during the first half of Friday’s OCC showdown in Lewis Center. Senior Jalen Bethel’s double-double led the host Olentangy Orange boys basketball team to a 71-65 victory over rival Olentangy Liberty in the OCC-Buckeye opener for both squads Friday night in Lewis Center. Bethel had 10 of his game-high 28 points in the fourth quarter to help the Pioneers (3-0, 1-0) hold off a furious comeback attempt by Liberty. Bethel and Calo cited the work in the offseason as the reason for the strong start. Orange used a 16-3 run in the third quarter to gain control and led 45-33 at the end of the frame. Bryson Lane had 13 points, Matt McCollum had 11 and Luke Ballinger added nine, including a couple of key free throws in the final minute to help hold Liberty off late. The Patriots (0-2, 0-1) went for 32 points in the fourth, knocking down four threes in the quarter to get it as close as two on a couple of occasions down the stretch before the shots stopped falling. Ben Roderick finished with 26 points, Nick Nakasian had 16 and Mitchell Okuley added nine to lead Liberty, which was without post player Llwyatt Hofer because of a sprained ankle. Orange is back at it tonight when it hosts Thomas Worthington in non-league play at 7:30 p.m. Liberty is off until Thursday when it hosts Westerville South in league action at 7:30 p.m.
https://www.delgazette.com/wp-content/uploads/sites/40/2017/12/web1_bethel.jpgOlentangy’s Orange’s Jalen Bethel, center, works against Liberty’s Ben Roderick, back, and Grant Wilson in the post during the first half of Friday’s OCC showdown in Lewis Center.